In 2004 I arranged with Mick Murphy, at that time the Manager of the Nelson Bay office of the New South Wales National Parks and Wildlife Service (NPWS), that Hunter Bird Observers Club and NPWS collaborate on a survey of shorebirds in Port Stephens. That survey, in February 2004, found some surprising results including more than 100 Australian Pied Oystercatchers were present. This is an Endangered species in NSW and at the time the total population in NSW was estimated to be less than 250 birds. Needless to say, we have continued to do surveys, also introducing a winter survey in 2008 to complement the summer survey. I coordinate them in conjunction with one of the Rangers from the NPWS Hunter Coast office. Six teams go out simultaneously in boats, covering all of the parts of Port Stephens where shorebirds potentially can be found. We also count all the other waterbirds that are present. Port Stephens was long known to be important for Eastern Curlews, with around 1% of the world population having been recorded there from time to time over previous decades. There also were indications that some other shorebirds, such as Bar-tailed Godwit, were present in high numbers. We have found >100 Australian Pied Oystercatchers in almost every survey. They mostly are adult birds and it seems they are “waiting” for a breeding territory to become available somewhere along the NSW coastline. 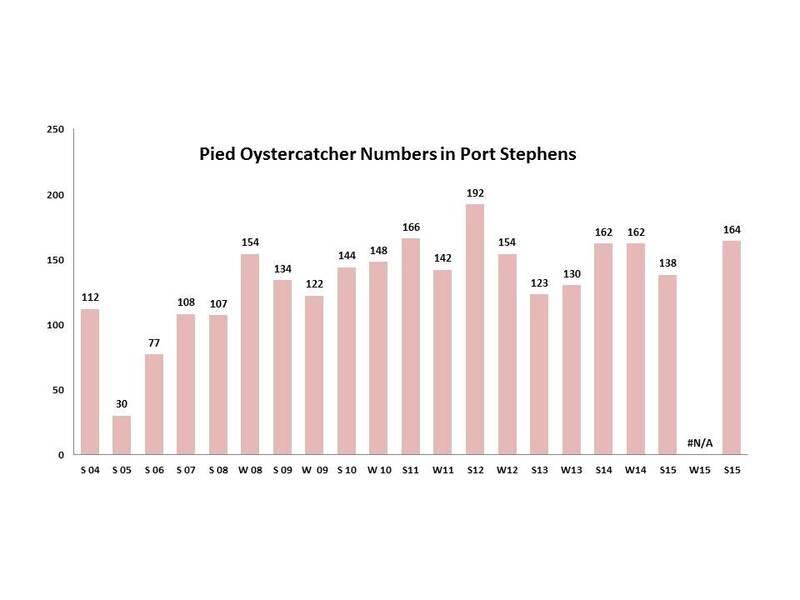 The numbers represent >1% of the total population of Australian Pied Oystercatchers, thus qualifying Port Stephens to be ranked as an internationally important site for them. We continue to find high numbers of Eastern Curlews, and the average count in summer is of numbers of more than 1% of the world population. Port Stephens is definitely an internationally important site for them. In recent years, the numbers of Sooty Oystercatchers have been increasing too – to a maximum count of 52 birds in February 2015. The counts since 2013 have all been in the high 30's or above. These are heartening numbers for a threatened species in NSW. I have several times given a presentation called The Waterbirds of Port Stephens, with minor updates incorporated each time. The presentation has been made during the annual OCCI/Port Stephens Council coastal awareness program. Dates: 22 March 2017, 23 March 2016, 18 March 2015, 19 March 2014. I made a presentation on The importance of Port Stephens for shorebirds at a Marine Discovery lecture on 25 May 2016. In October, Neil Fraser and I have found two nests of Pied Oystercatchers, and a Beach Stone-Curlew nest with egg in early October which the egg either then hatched or was predated. We were not able to do a winter survey in 2017. We twice had one all organised (boats, skippers, surveyors, etc) and then had to call it off because of forecasted poor weather conditions (mostly, the issue was going to be the wind). The 2017 summer survey took place on Friday 10th February. The positive aspects included that we had almost 1,000 individuals of threatened species including our highest ever count of Little Terns (and some evidence that they had bred). Also, 1% of the world population of Aust. Pied Oystercatchers were present. However, it was also our lowest ever count of shorebirds apart from in 2005 which was an aberrant year. We only found 945 shorebirds in total. These are the main results (shorebirds only; there also were also 1,538 other waterbirds): Pied Oystercatcher 109; Sooty Oystercatcher 37; Bar-tailed Godwit 82; Eastern Curlew 127; Total Shorebirds 512; Total Migratory Shorebirds 304. The 2016 winter survey took place on 22 July. We were incredibly lucky with the weather (on just about any other day within a week either side of the 22nd, we might not have got out). These are the main results (shorebirds only; there also were also 1,584 other waterbirds): Pied Oystercatcher 120; Sooty Oystercatcher 31; Bar-tailed Godwit 394; Eastern Curlew 226; Total Shorebirds 936; Total Migratory Shorebirds 764. The 2016 summer survey happened on 19 February. These are the main results (shorebirds only; there also were also 1,241 other waterbirds): Pied Oystercatcher 164; Sooty Oystercatcher 42; Bar-tailed Godwit 528; Eastern Curlew 263; Total Shorebirds 1,421; Total Migratory Shorebirds 1,157.